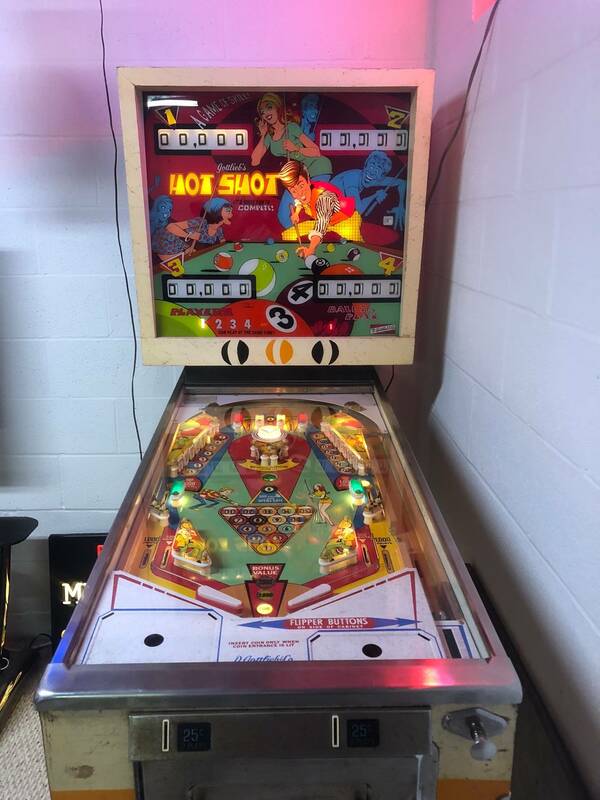 » Forum » Electro-Mechanical » EM Pinball Hangout » Gottlieb Hot Shot keeps running when pluged in! Need advice. » Gottlieb Hot Shot keeps running when pluged in! Need advice. 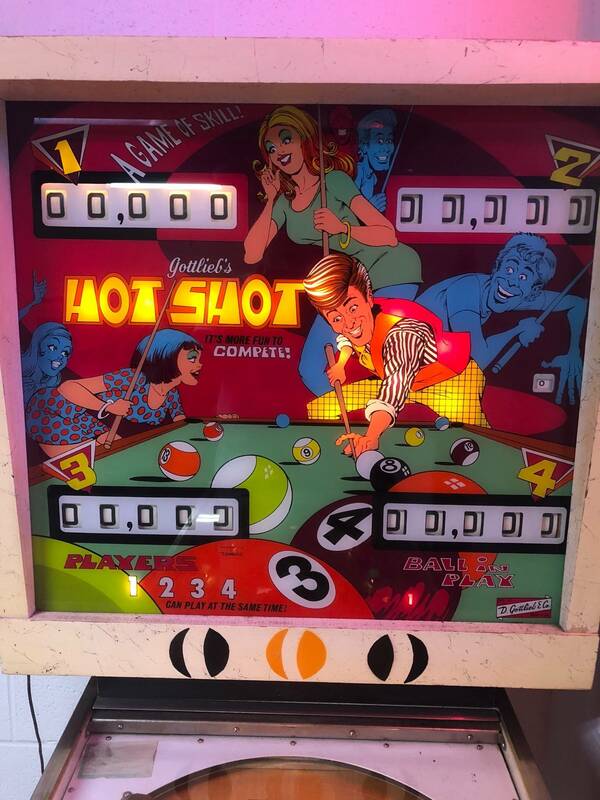 Gottlieb Hot Shot keeps running when pluged in! Need advice. There have been 108 images uploaded to this topic. (View topic image gallery). There are 284 posts in this topic. You are on page 1 of 6. 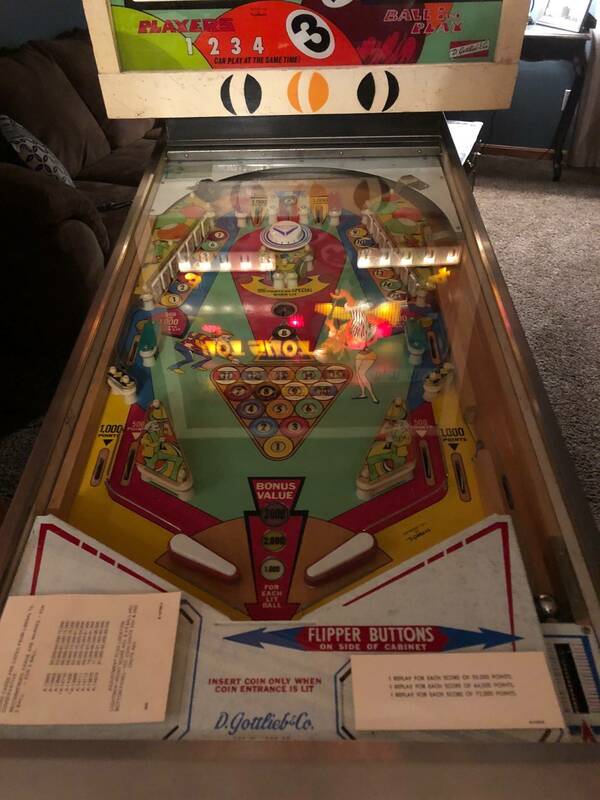 I'm new to the em pinball world but I'm learning and like learning. 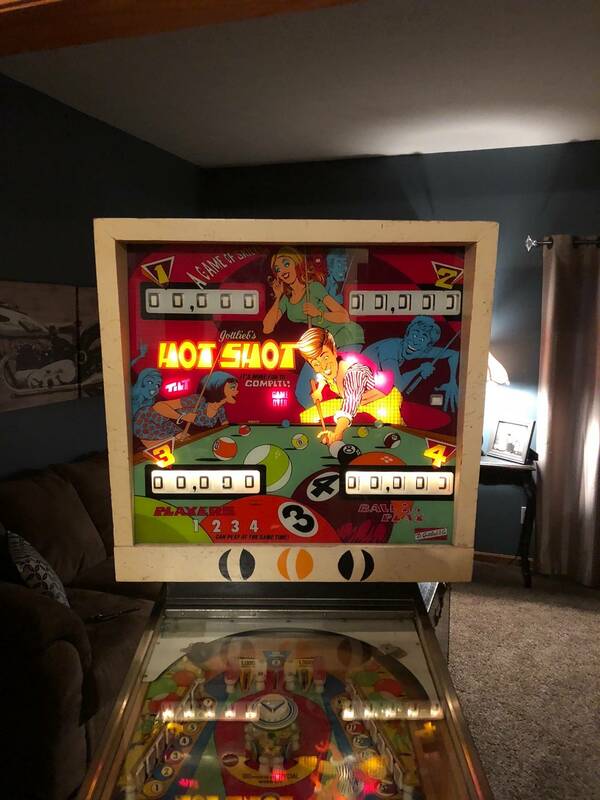 I just got a1973 or 74 Gottlieb Hot shot. When I plug it in it keeps running right away like its trying to reset. The tilt and game over blinks on and off and the reset thing for the drop targets keeps poping. 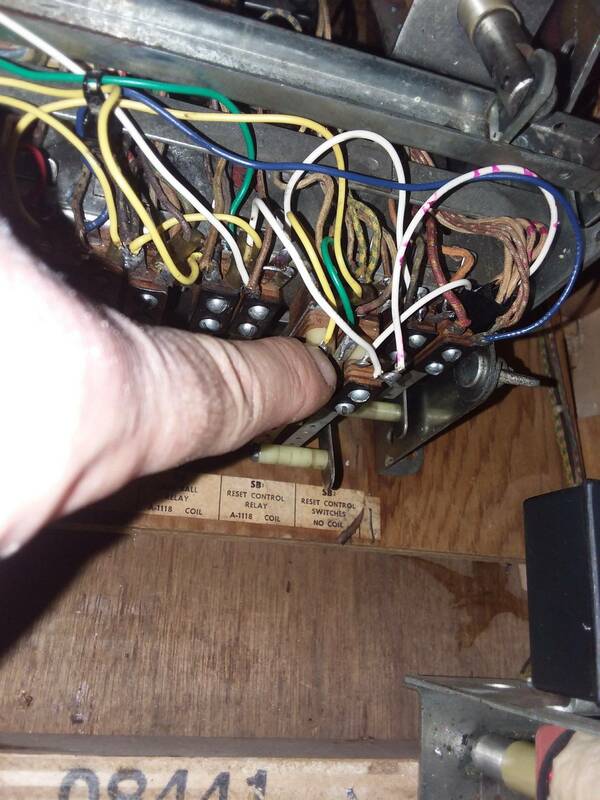 I set the score reels at 0, cleaned contacs, checked over all the relays thinking something is stuck togetther or a wire crossed or what ever. Did All I could think of and still the same result. Can I please have some tips, thoughts or something from some one who may have experienced this before? Or any body with an idea. read up on pinrepair.com. They have a great EM guide that you should run thru. 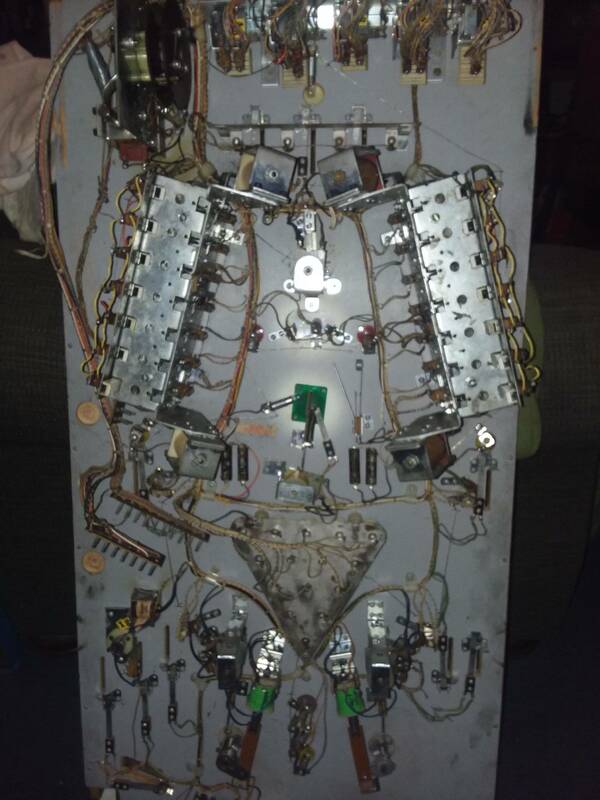 Do you have a schematic for this machine? 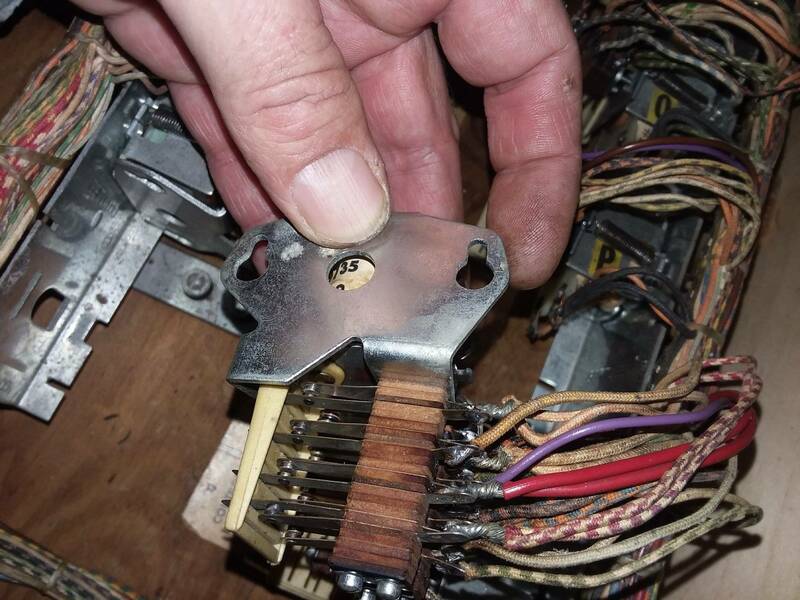 There are a number of switches that could be closed that would cause the motor to spin when you turn the machine on. 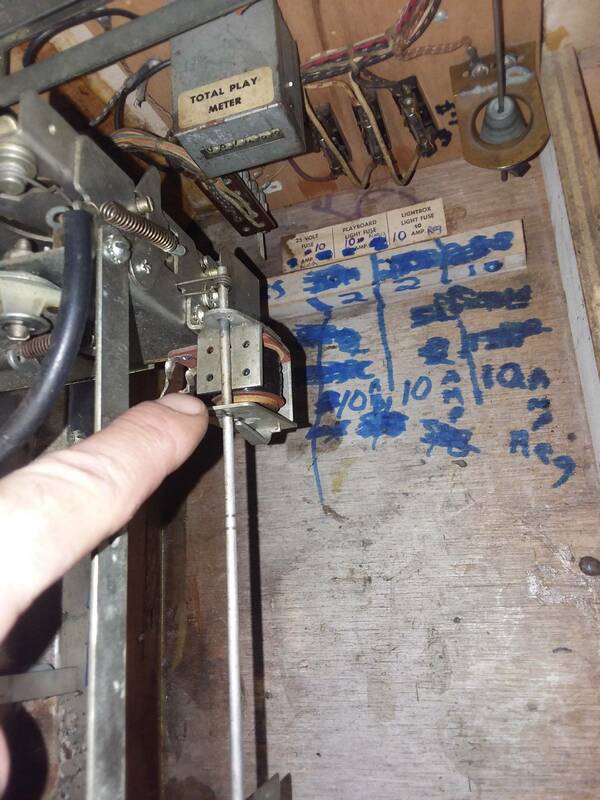 Here you can see the relay switches that when any one is closed the score motor will run. I keep that website up on my lap top next to me while I work. I took out the play field and I pluged it in and it stopped running. Checked the relays and fixed some wires I thought looked pretty loose. I put every thing back together. I can plug it in and the back glass lights up. I hit the start button on the door and it runs again. 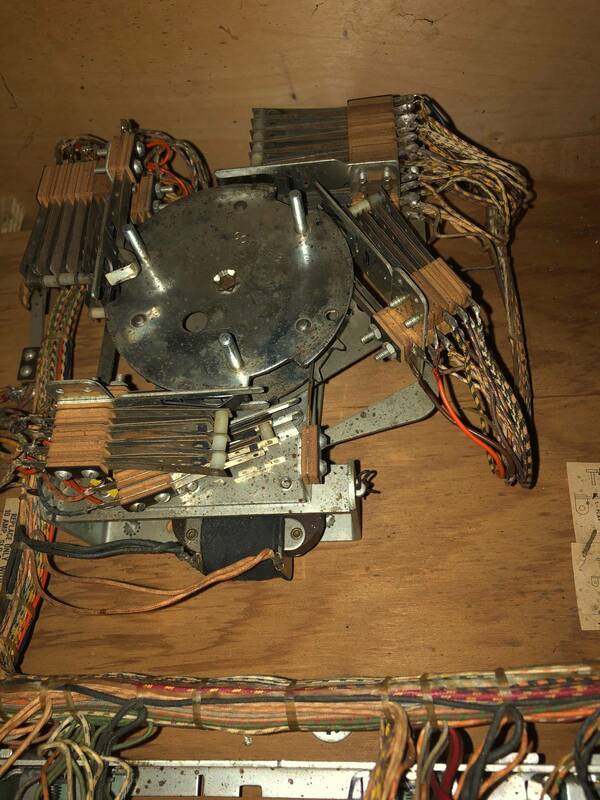 Now there it a stepper motor on the bottom right of the play field. There is a pare of contacts along the disk. There are2 notches on the disk. The contacts ride along it the when the notches come along they open real quick then close off again. They open on half a step then close back up. 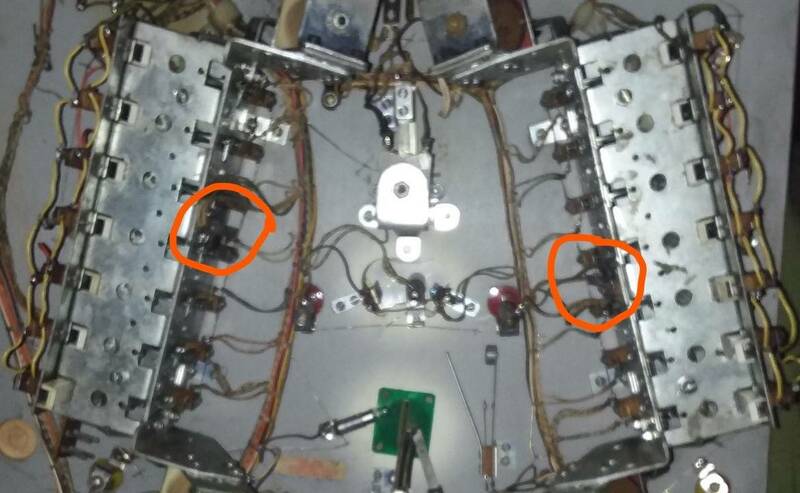 Now are those set on contacts a break For that stepper and it could be not be adjusted correctly? 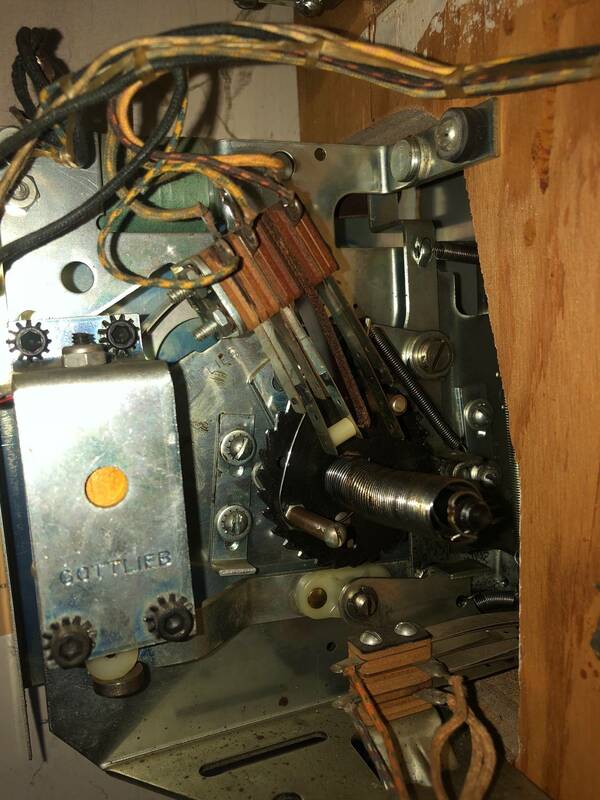 Read up on score reel switches finding home position too. 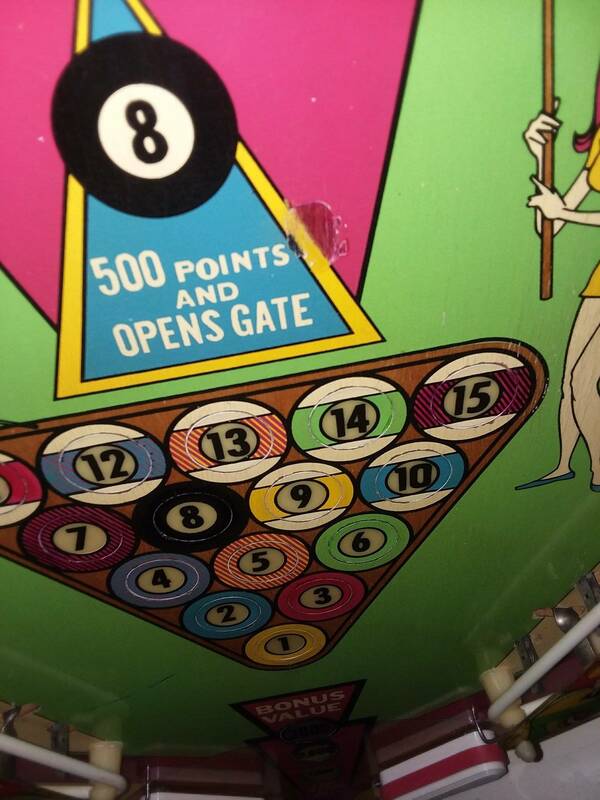 If I understood correctly, with the playfield removed the game would reset properly. 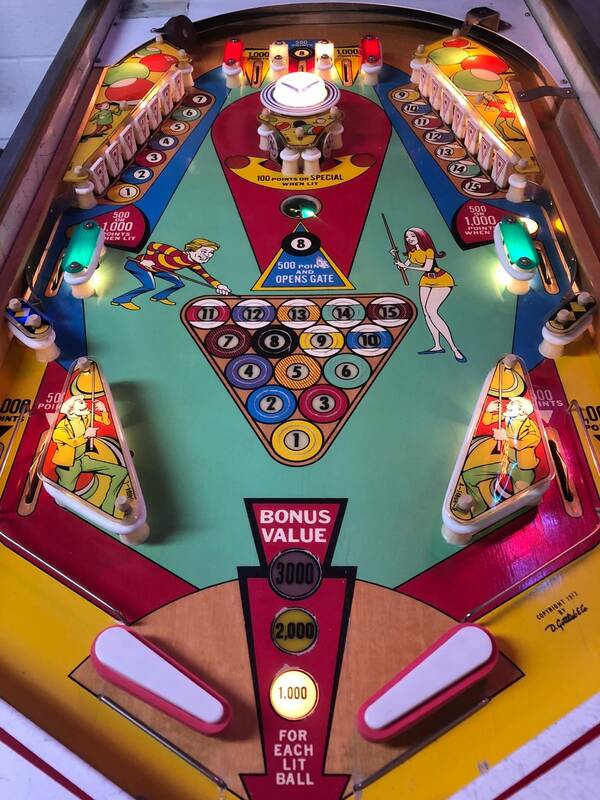 When the playfield is connected the score motor continues to run. 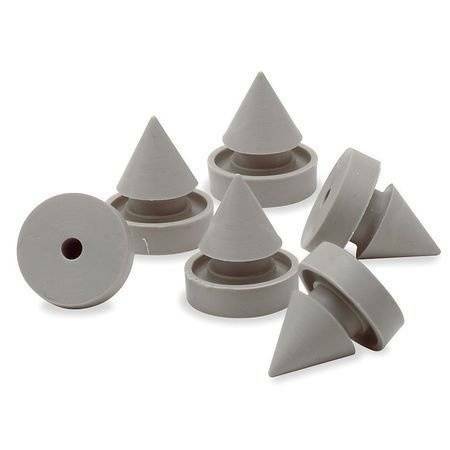 Any labeling you see would help us identify the part in question. 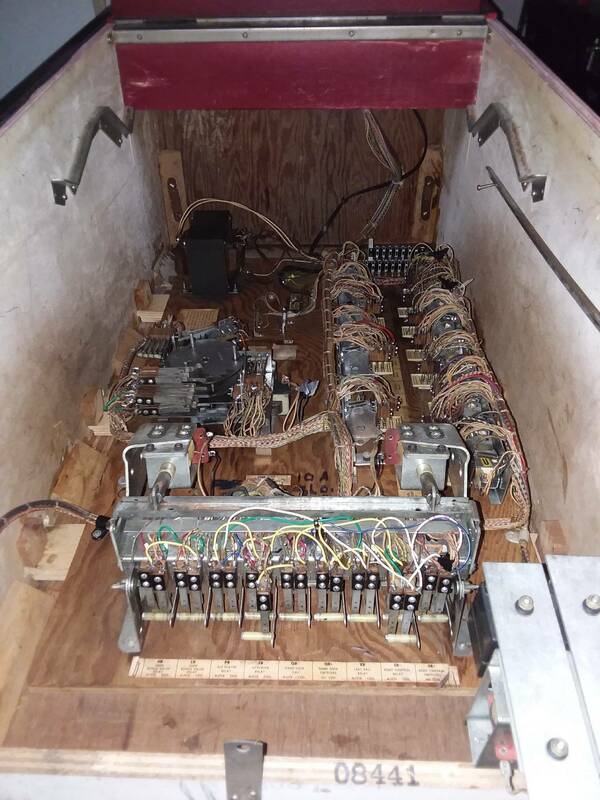 A larger style stepper unit attached to the bottom side of the playfield would be the bonus unit. If it's a small style (like the match unit stepper) it's for other playfield logic. The bonus unit should reset at the start. All bonus units should reset at the start of the game. There will be a set of contacts associated with a reset. Most bonus units will have one coil to reset and another to step for each bonus achieved. Verify the bonus unit is clean and moves freely. Most bonus units will reset to the first set of contacts. If it is slightly off, there is a set screw assembly at the base of the disc that allows for fine movement of the discs. 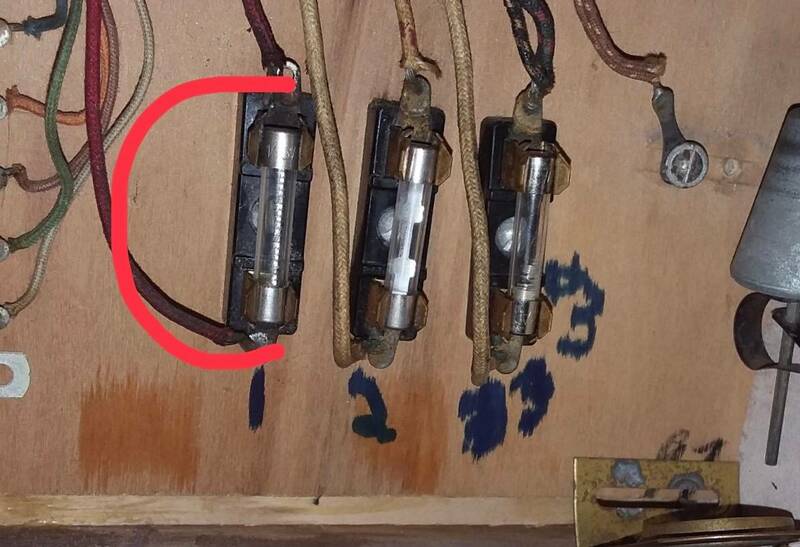 I may have missed this.....There is a switch blade on the score motor that acts as a brake for the motor. If that blade breaks off, the motor will spin constantly. This is a common issue with Gottlieb score motors. 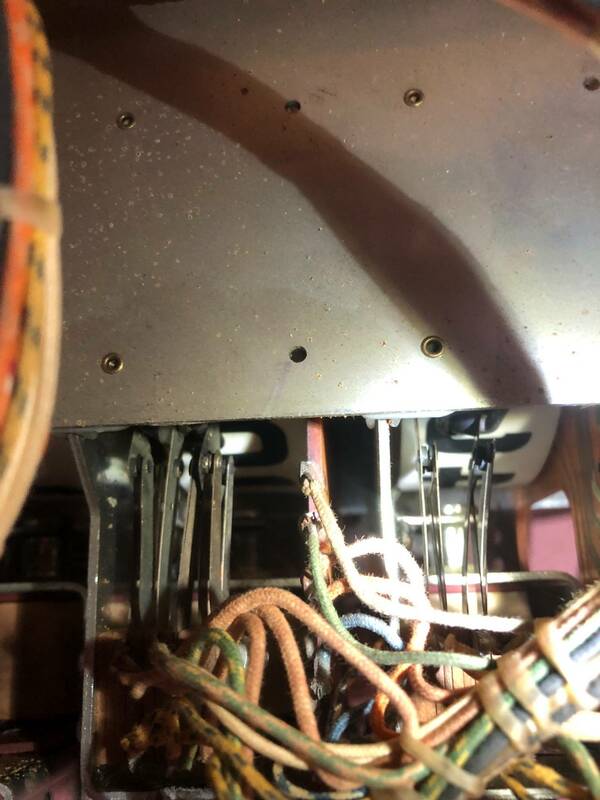 If the "brake switch" does not do its job, the score motor will overrun its stop position and reactivate the motor looking for the next stop position which it will also run past etc. etc. Something simple to look for and rule out. It is on a mount all by itself and has no wires running to it. The blade should "grab" a pin on the motor plate at each of the three stop positions. I can plug it in and the back glass lights up. I hit the start button on the door and it runs again. It sound from Dans post that now the motor runs when the start button is pressed and never stops. Wow thanks for the help everyone! Tryed everything with the score reels at 0 and got same result. My concern is with this motor. The contact with no wires is broke and doesn't toutch the motor at all! Could this be the issue? I hope it is. I don't get how it tells the motor to stop with no wires or contacts. Your brake switch is broke. They are cheap at PBR. It definitely could be your problem. The motor will run past home and continue on. the reset thing for the drop targets keeps popping. Check the 'P' relay ^that would give that symptom your describing , never allowing a correct reset. The broken brake switch is common but doubt thats your issue,but replacing it is not a bad idea. Seen some broken(never fixed them either) but still stopped and not creating a non-stop reset. I don't get how it tells the motor to stop with no wires or contacts. Do you have a schematic? If not I suggest you get one. way2wyrd has great advice to locate the specific switch(es) which run the motor, that's a great start. 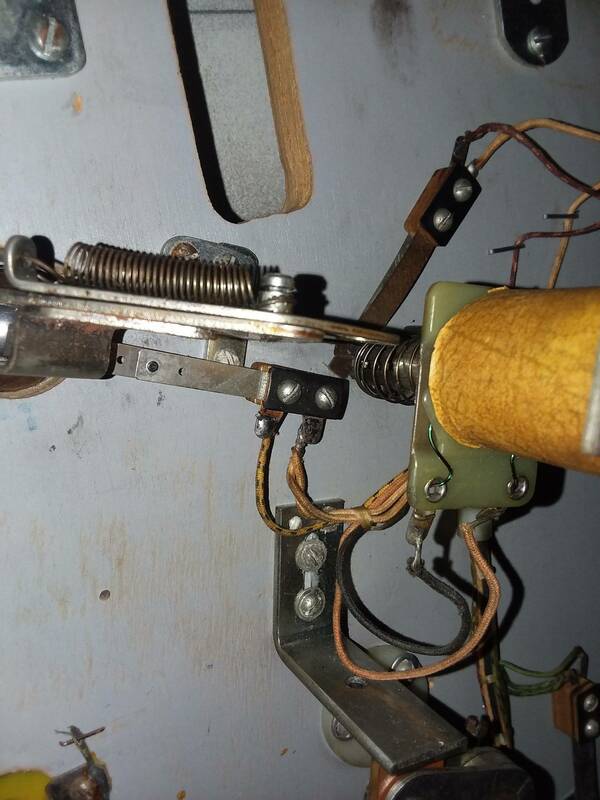 Thats the brake switch I was talking about! Get a new one and put it in before you try messing with anything else. It is not an electrical switch that tells the game anything. It simply applies drag to stop the rotation of the motor so it does not overrun its stop positions. Alright I fixed the brake on the motor. Went over the P relay made sure. The contacts sit flush with each other. . Now when I turn on the machine. The ZB 1st player, QB1 game over relay and the QB2 switches are activated. They buzz like crazy. When I hit the start switch everything resets normal but the credits keep adding up. Motor keeps running. Ill in plug it and plug it back in and it does the same. Check for a closed switch on your coin door. Im just happy im getting different results! The drop targets stopped trying to reset. And is making doing different things. So I must be going somewhere with it. This thing hasnt Been used in years so I expect it to be a challenge. Can't say thanks enough for the help! So anyway Coin door switches are fine. I unplugged the coin door and still had the same problem. Is there a relay stuck somewhere I should check? what relays could relate to this? and the buzzing in my relay bank is new. I probably should have wrote down what relays were triggered before. When I hit the start switch everything resets normal but the credits keep adding up. Sounds like a coin chute relay ^^ i believe its the (W- 2nd chute) labeled you should look for as that would add your credits up like that. Check operation and clean / gap. Cleaned some relay and adjusted a contact on the first player relay. That seemed to stop the credets from running. Now the game runs for a while like its trying to reset. 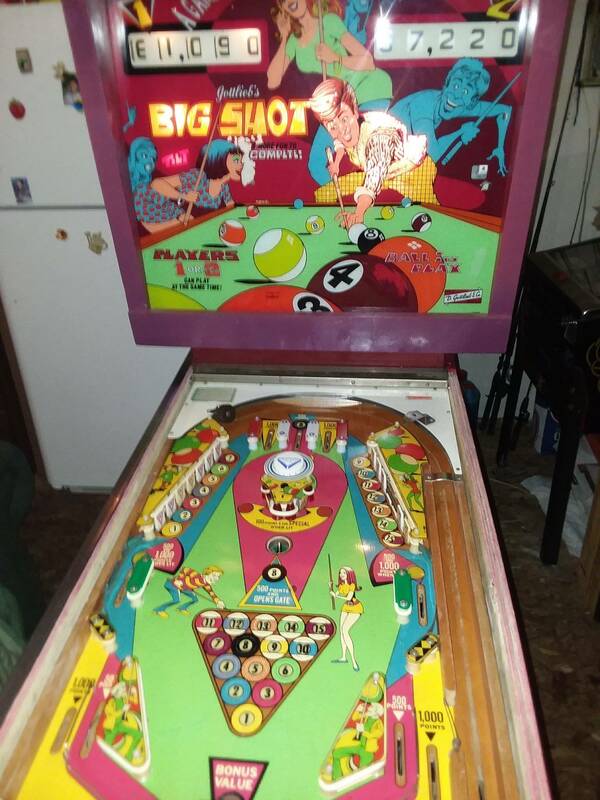 It throws the ball into the shooter lane but it says tilt. Doesn't do anything until the ball goes into the hole to end the game. Then Runs again resets the ball at ball 5 or what ever it feels like. Could it be that stepper unit in the back box?? or should I look for a relay problem? Adjusted a contact in the 1st player relay. Now I have no credit troubles. I went over one other relay. Now the games seems to takes its time to reset. Then it throws the ball into the shooter lane. Runs some more then goes to ball 1 tilt mode. I shoot the ball for giggles and as soon as it goes down into the hole it runs again sometimes resets again. Could this be an issue with the stepper in the back box? Or relay issue? I went over everything cleaned it all up made sure everything is smooth. Still does the same thing. While it's resetting the 2000 3000 bonus points relays activate. What causes this? Alright thank you . So ill check the Zb and xb and see if that's my issue. Just a simple hint. Check all home switches on anything that resets at game start up. It has to have a complete circuit through all the home switches (score reels, drop targets, etc.) 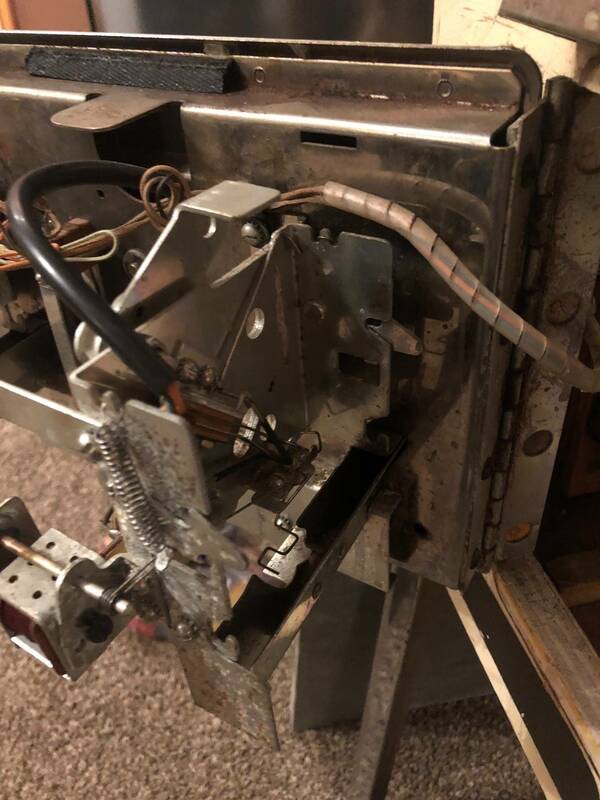 to get it to start OTHERWISE it will do exactly what yours is doing, it will just keep running the motor and keep resetting. Can you post a pic or video of this? I'm not sure I understand what you are describing. I messed with it a bit and I think it's ok now. Ill take a video of every thing to show what it's still doing. Here is the video. If u want to see a part working closer up with better light let me know. I was pretty tired so excuse me for shakiness or I talk too quiet. I don't see a link to it. You need to post your video somewhere like youtube and then put a link to it in the body of your post here on pinside. As far as I know, you can't directly upload video here like you can with a PDF or JPEG etc. haha i know its a little hard to post with my ipod. I hope this works! Gutted the machine and I'm going through every switch and wire with a test light. Fixed little things here and there. Hope it's does something when I put it together. 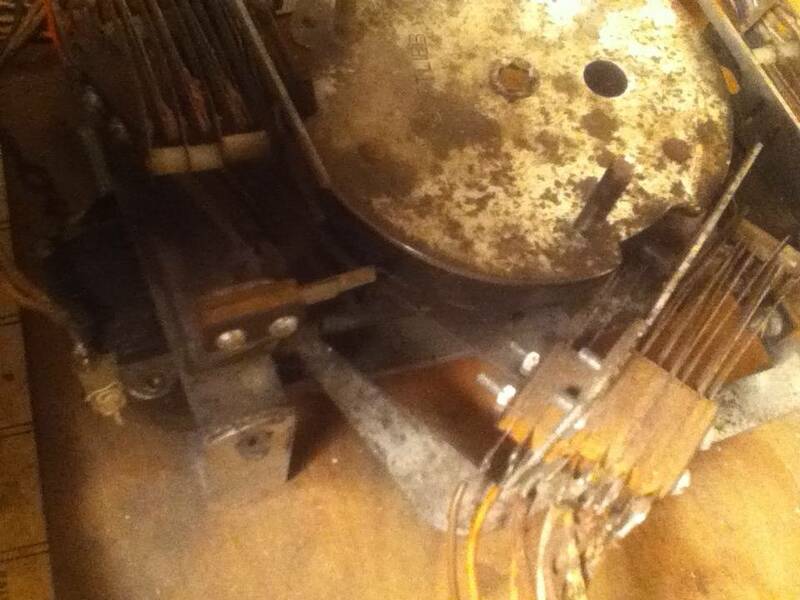 Did you look at the score reels to see if you have any broken solder joints? 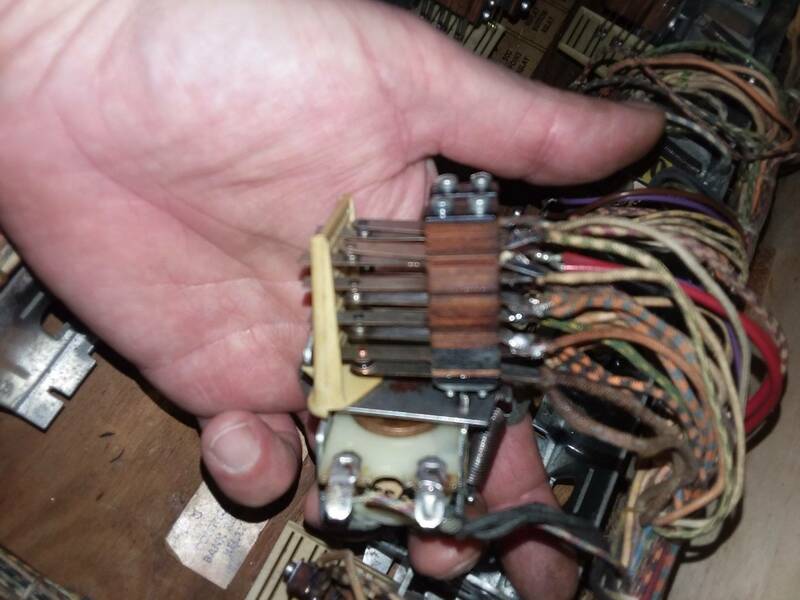 (tug on each wire to make sure)also see if the reels zero position switches are clean and providing continuity? Scrub your video to 6:40, it appears your player unit is rolling over and over trying to find home position. 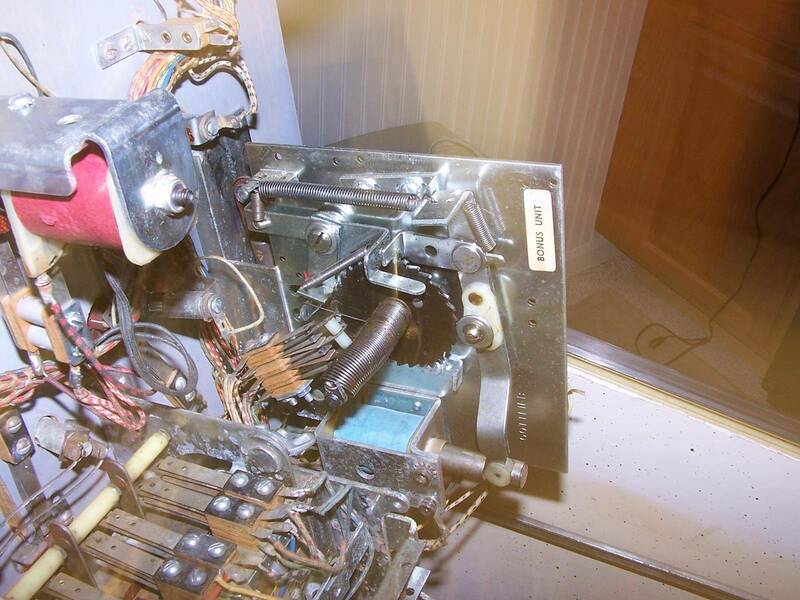 *Check the cam switches in the back of the player unit, behind the rotating disk. *Also make sure the Player Unit disk shoes are contacting the rivets properly. *Make sure the wire is intact which contacts one rotor shoe to the other. *When the Player Unit cam is in home position make sure the rotor is in contact with the correct rivets. If not you can order one and save yourself endless hours/days of chasing things. My suggestions here are really just a shot in the dark, based on the partial scan of a 1975 Gottlieb "Soccer" 2 player game. I have a schematic but I havnt really began to figure our how to relate everything on it to the machine. I gave up on that and started just to check and see if anything is wrong. 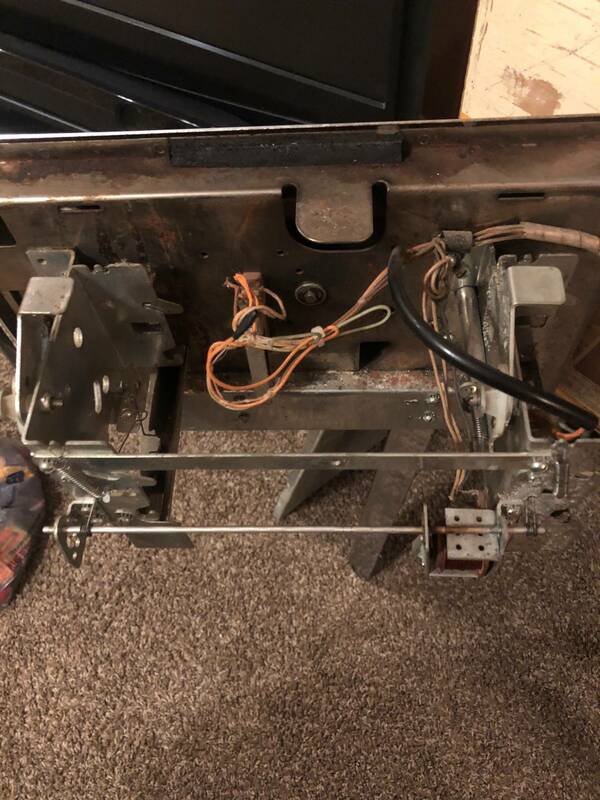 There is a ground wire or something connected on the mount of that stepper u were talking about. Idk if its supposed to be there or what. Ill take a pic later so u can't Manet understand what I'm saying. There is often a wire connected to a stepper frame which is part of a circuit. It will usually complete a circuit to one of the rotor shoes. This is it it looks like it was tampered or something. Wasn't sure. Ok started back on this one this morning (was hoping to see some helpful sugggestions when I woke up lol). Status - the head powers and lights up but the play field does NOT. Looked over all fuses and seem good. The bonus reel (?? Pictured above ) keeps trying to rotate when I power her up. 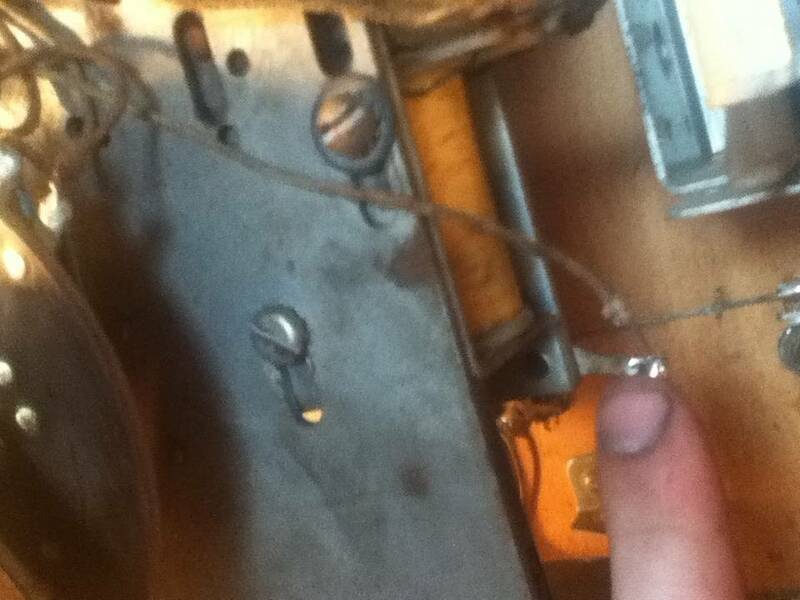 But again seeing that pin with the wire or spring wrapped around it I think is the culprit. Ok. I’ll keep posting until someone feels sorry for me lol. But seriously I messed up. That photo was not the bonus reel. (As the thread was mentioning that and this part was also rotating I thought it was that. Dumb newbie. Forgive me. ). After stepping that part (looks like the reel in the head for added credits?) but it now looks correct. The brake tab is in place. Read that part a few times. The bonus reel (found it lol) does work per the posting above. So some good news. When I now fire it up the relays ZB and QB immediately activate. Play field still does not have lights ?? Head does. No fuses are bad. In cab. Under playfield board. In head. Maybe until it fully starts no lights on the playfield ? Again I’m a newbie to all of this. But find it fascinating and interesting. All my machines have their original manuals schematics and even original bulb/fuse bags. They’re sweet just need TLC. Even a blind squirrel .... ok quick and happy update. Looking back at the original reel (thought it was the “bonus “ but that’s in the cab. This one is the credit reel. First photo posted here by me. This had in fact rotated around and got stuck up in the relay blades. So worked that Around until it released. Powered it up and viola the game resets. Kicks a ball out and the game field lights up and seems to respond to the ball coorectly. Second after the first ball drains - it’s game over. Hi. I don't have any advice to offer, but I am reading your posts and I am glad you are making progress! Talk about resurrecting the dead?!? 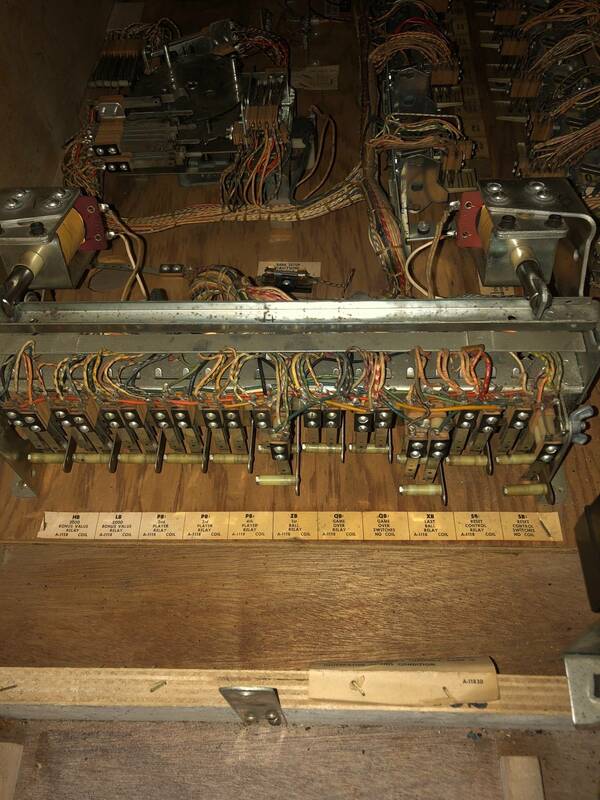 Still no sounds (chime bars) - all wiring looks good, fuses, etc - so really could use some expertise help on that one?? Once the 1st ball drains, it quickly kicks out for the next round, but simultaneously it goes into "game over"??? Its been a long time since I posted here in the EM forum. 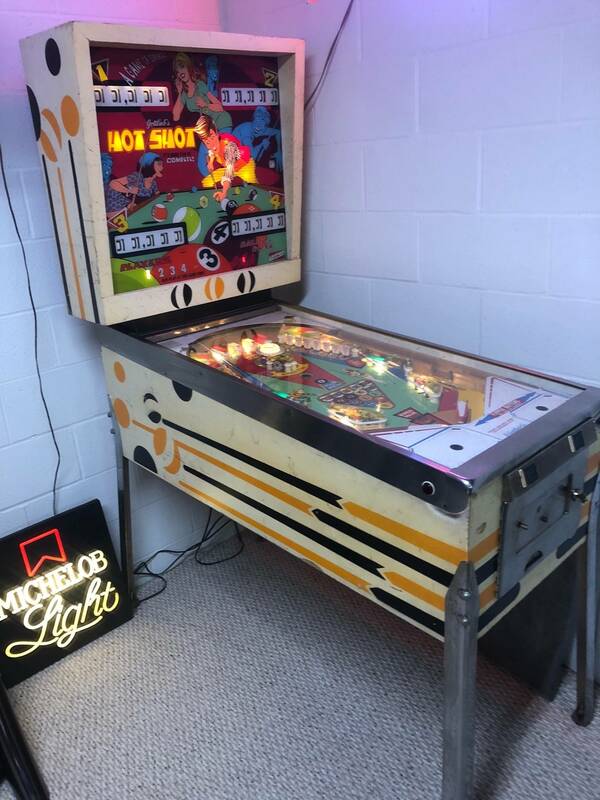 I'm by no means an EM expert but I do have some good experience with hands-on, learn as you go, pinball repair. Here are a couple links to valuable EM repair guidance. I learned a lot from these documents. Hope they help you too. On the sounds, I'm going to check my equipment again for loose or broken washers, rod ends, etc - but I'm thinking (ok, hoping?) it's something small, simple, that is just not letting the unit get the proper signal(s). Check to make sure that the plungers move freely in the coils. Oftentimes, the cushioning material on the bottom of the unit will turn all gooey and gum up the plungers so that they get stuck in the coils.